The team projects total 2016 attendance will rise by 500,000 to 3.1 million, generating an additional $25 million in revenue, a source said. The New York Mets swept their way into the franchise’s first World Series in 15 years, and Citi Field bondholders are cheering along with the team’s fans. Riding on this season’s playoff run, the team projects total 2016 attendance will rise by 500,000 to 3.1 million, generating an additional $25 million in revenue, according to a person familiar with the estimate. That’s on top of a 20 percent attendance increase this year. The Mets beat the Chicago Cubs 8-3 on Wednesday night in Chicago, taking the seven-game series 4-0 and qualifying for the World Series. That’s good news for fans who suffered as the team cut payroll after the the majority owners of the club, led by Fred Wilpon, lost millions investing with Ponzi scheme swindler Bernie Madoff. It’s also good news for holders of almost $700 million Citi Field bonds, who’ve seen the ball park’s attendance and revenue fall below projections. When the 42,000-seat Citi Field opened in 2009, the team projected an average attendance of about 37,980 in 2013, according to a bond offering statement. Instead, the Mets sold an average of 26,366 tickets per game that year, according to Baseball-Reference.com, falling short of projections by 31 percent. Last year, the Mets sixth consecutive losing season, turnout averaged 26,528. Boosting attendance to 3.1 million in 2016 would bring the average to 38,272. The Mets didn’t project attendance beyond 2013 in their bond offering statement. Mets spokesman Harold Kaufman declined to comment. Attendance at Kansas City Royals games has increased almost 40 percent this year to 2.7 million, one year after they won the American League championship. The Royals lost to the San Francisco Giants in last year’s World Series. The Royals are one game away from the World Series. A 500,000 increase in Mets attendance would result in a ‘meaningful” increase in the ratio of revenue available to pay debt service, said John Miller, co-head of fixed income at Nuveen Asset Management in Chicago. Nuveen is the largest holder of the longest-dated Citi Field bonds. “I’m sure this season is going to help,” he said. 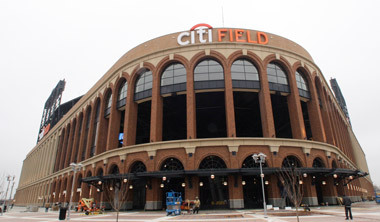 The Mets sold $613 million municipal bonds in 2006 backed by payments in lieu of property taxes, lease revenue and installment payments to finance the construction of Citi Field. The team also issued $82.3 million of insured debt in 2009, the year the ballpark opened. The 2006 bonds are rated Ba1 by Moody’s Investors Service and BB+ by Standard & Poor’s, one step below investment grade. Citi Field bonds don’t trade frequently because investors hold them for their higher yields, Miller said. Citi Field bonds with a 5 percent coupon and callable in January 2017 traded Monday among dealers at a yield range between 2.8 percent and 3.4 percent. Top-rated bonds maturing in one-year yield 0.3 percent. “There’s certain scarcity value to them that’s helping their performance,” Miller said. In 2014, Citi Field generated about $117 million in revenue and had about $84 million in expenses, including a $43 million payment in lieu of taxes, according to a financial statement filed by Queens Ballpark Company LLC, a Mets subsidiary. Citi Field bonds are rated below investment grade in part because of inadequate reserves to make up any deficits that may result from a players’ strike or an economic downturn, according to S&P. Debt-service reserves are guaranteed by a unit of Ambac Financial Group Inc., which had its rating cut to junk in 2009 because of losses it suffered insuring derivatives during the financial crisis. An attendance boost alone won’t be enough for a rating change, said S&P analyst Ben Macdonald. –With assistance from Scott Soshnick and Brian Chappatta in New York and Garfield Reynolds in Sydney.